An interesting subset of drinking fountains are those put out with a purpose other than just providing water. Some, like the Petaluma, California fountain shown above, are more propaganda than amenity, spelling out a certain way users should live. Portland's Benson Bubblers, too, were given to the city as a way to fight the allure of bars and taverns. The bottle fillers featured in the last post are sort of the modern equivalent of abstinence fountains, condemning the modern behavior of buying plastic water bottles. Promoting a different set of values altogether are the old pre-Civil Rights era drinking fountains, used to enforce exclusion and segregation. Using basic drinking water as an enforcer of class status was an incredibly powerful symbol of inequality. 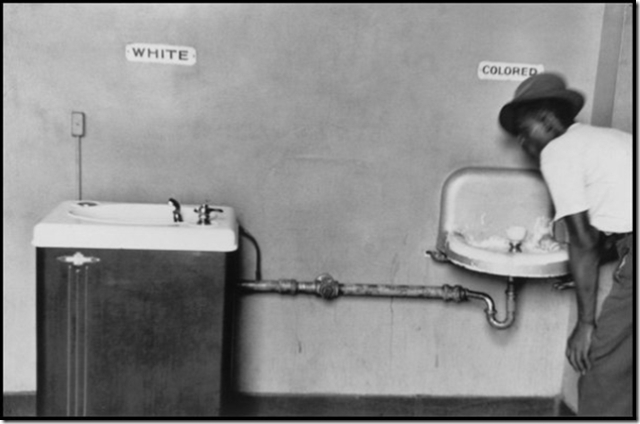 Today, most drinking fountains go to great lengths to be inclusive. The Americans with Disabilities Act requires public fountains to be wheelchair accessible, and many fountains include stools for children and separate fountains for dogs. We've come a long way.